We have samples of many of our CDs online so you can listen before you buy. Visit our listening center HERE. 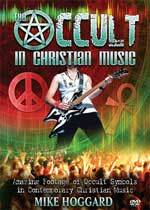 PRM-08-DVD/pc-DVD - The Occult In Christian Music - by Pastor Hoggard This item is on sale. Did you know that much Contemporary and Rock music being played right now in Christian Churches are heavily laced with Luciferian occultism? Pastor Hoggard will literally blow your minds as he reveals how churches are regularly being inundated with occult values, doctrines, and symbols, without anyone ever understanding! Pastor also shows the sensual worldly nature of this music and why it is not worthy to be played in the House of God! This warning is BADLY NEEDED during this time of unbelievable End Times apostasy threatening to engulf the Christian Church -- you and your family are being affected if you are attending churches playing this kind of music. A MUST SEE video for every Christian, but especially Pastors and Deacons. The contemporary music so beloved by young people in your church may be straight out of the Abyss! NOTE: This DVD just has a new front cover; the content is the same as Hoggard's original DVD by the same title.